Cilegon City is part of Banten Province. It is also the home of Krakatau Junction Infinite Jogging Track. As the name suggests, this park becomes a favorite location among travelers and joggers. The location is in the midst of Cilegon City. It also functions as a city park. Today, many visitors come to the park for either relaxation or jogging. Most of them are the locals, but outsiders often visit it as well. The combination of cool atmosphere and shady trees are definitely peaceful. Once you get to Krakatau Junction Infinite Jogging Track, you can feel a serene nuance. The path is well-paved and it is surrounded by trees. 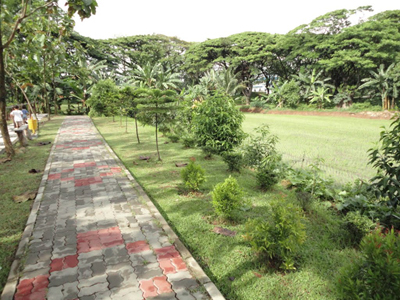 Some parts of the jogging track feature grassy lands, as well. These features are definitely calming. Thanks to the plants and trees. They help create a fresh and healthy air. No wonder, visitors take advantage of this jogging track to retain and improve their health. Not many people come to this location at the same time. That means the nuance is a little bit peaceful and spacious. The best time to visit the jogging track is on weekend or holidays. Most of the locals visit it on Sunday, actually. It is because they have lots of work to do on regular days. The weekend becomes an opportunity to do some simple sports, especially jogging. Make sure to come in the morning, though. It is because of the atmosphere. You can feel the freshest nuance in the morning. At least, you should have been there at 6 am. Another reason is the parking area. If you come late, you won’t get enough space for parking. It doesn’t have to be jogging. You can do a simple walk, as well. The thing is you must wear proper footwear. Once you have prepared the equipment, it is time to explore the location. In some occasions, there is a local impromptu market. Many types of foods and items are sold here. Apart from jogging, you can also buy some items. It becomes your opportunity to try local specialties, as well. These include “ketoprak” and “bakso”. On top of that, the price is affordable. In a nutshell, Krakatau Junction Infinite Jogging Track is the most recommended location for jogging and relaxation. Here is the thing. You should never underestimate jogging. It helps you to retain health and confidence. With a simple movement, you can maintain weight and look younger. Somehow, it helps you increase stamina and endurance. If you come with families or friends, jogging help you improve your social relationship. It is an opportunity for bonding. A trip to Krakatau Infinite Jogging Track takes about 2 hours and 30 minutes from Jakarta. Overall, your prime destination is Cilegon City. The total distance is 122 km so it can be a tiring trip for many. What about the route? Usually, travelers take Pantura Street. It is the fastest way to reach the location, after all.